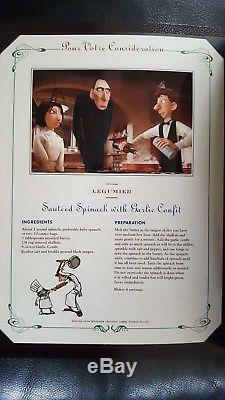 This promotional booklet (magazine size - 16 pages plus front and back cover) for the Disney/Pixar film Ratatouille is actually a real cookbook featuring recipes from acclaimed chef Thomas Keller - recipes include flatiron steak with herb butter, parmesan crisps and goat cheese mousse. Lots of great pictures from the film and even a special letter from the critic Ego himself! A must for any disney fan. 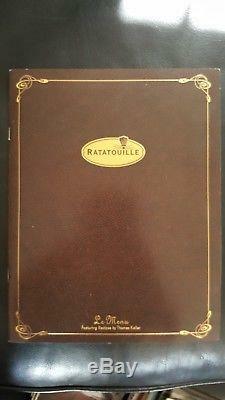 The item "RATATOUILLE Rare Promo Cookbook Disney Thomas Keller Pixar" is in sale since Thursday, September 13, 2018. This item is in the category "Entertainment Memorabilia\Movie Memorabilia\Other Movie Memorabilia". The seller is "in_usa" and is located in California.